Kochi Metro Rail is nearing completion. This article lets you know about the minimum and maximum fares for travelling in the metro. 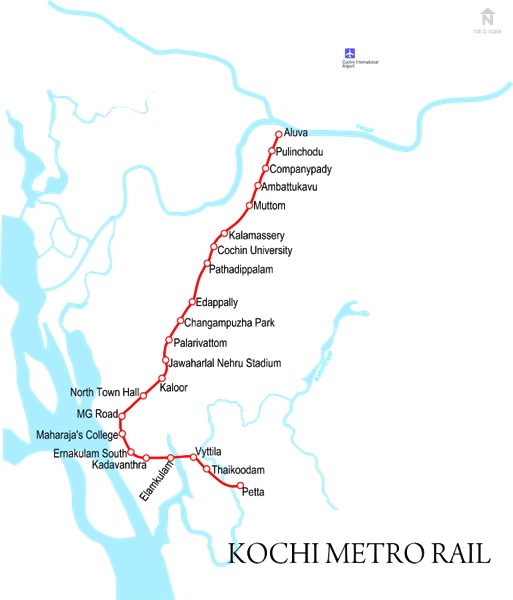 Also know about how Kochi Metro Rail project is implemented. Kochi Metro Rail construction is fast completing which covers the route from Aluva in the northern suburbs of the city going through Kalamassery, Edapally and Ernakulam downtown MG Road to Vyttila and reach Pettah, near the eastern suburban region of Thrippunithura. There are also talks regarding the extension of metro rail to reach the city's IT destination of Kakkanad and also to Thrippunithura. Kochi Metro Rail minimum fare is fixed as Rs 10 and the maximum charge is Rs 40. The fares are fixed after an initial study report from IIM Bengaluru. But, as per Kochi Metro Rail Limited officials, there is no final decision taken on metro rail fares. Within two months time, the final decision on fares will be announced. The decision on metro fares are calculated after a research done on the fares for 1-kilometre travel in various public transportation facilities in Kochi and also compared the fares charged by various metro rails in the country. During the initial planning phase of Kochi Metro Rail Project in 2011 also, the minimum fare was recommended as Rs 10. 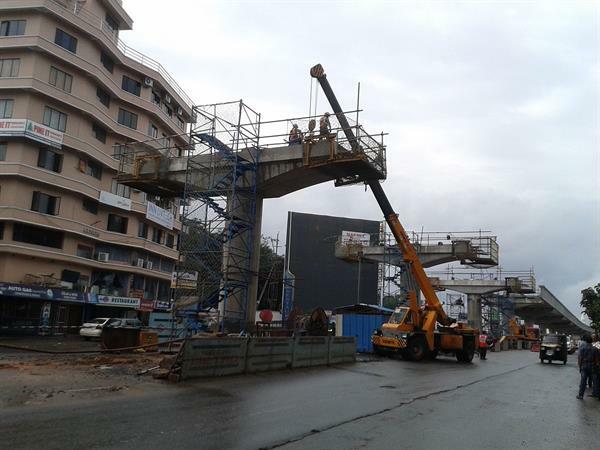 Kochi Metro Rail has planned the Metro rail schedules to be operating from 6AM in the morning till 11PM in the night. During the busy hours in the mornings and evenings, trains will be operated in every 5-minute intervals. While in off-peak times, trains will be operated in a gap of 10 to 15 minutes. The final time schedules for the metro trains will be published one month before the metro services go operational. The speculated time taken for the trains to travel from Aluva to Petta is 42 minutes. It will take 22 minutes to reach Palarivattom from Aluva. Kochi Metro Rail is a massive project that has huge investments in the tunes of thousands of crores and also very high-level expertise for project implementation which is meticulously being carried out by the assistance of DMRC (Delhi Metro Rail Corporation) by KMRL (Kochi Metro Rail Limited). The cost for Kochi Metro Rail Project is estimated to be Rs 5182 Crores. This figure is the combined share of central government and state government funding and also through loans taken from private agencies. The Kerala government share in the metro project is 35.85 percent which also includes the cost of land acquisition for the metro railway. The share from the centre is 20.27 percent and the private funds taken is 43.33 percent. The loans for Kochi Metro Rail project are taken from French external development agency - Agence Française de Développement (AFD) and Canara bank. Loan from AFD is 180 million Euros and Canara bank sanctioned Rs 1,170 Crores for the metro project. French external development agency has agreed to provide loan for the second phase extension of Kochi Metro Rail to Kakkanad, the IT hub of Kochi. The loan for the widening of Vyttila-Petta road, as part of Kochi Metro, is taken from Ernakulam District Co-operative Bank. German bank KfW is giving loan for the Integrated water transport project for the city as part of Kochi Metro Rail project. The city's major attractions are beaches and backwaters. The island is surrounded by the Arabian Sea in the west and Periyar River in the east. It is an ideal place to spend a weekend and a day won't be enough even if all the beaches are lying in one stretch. You can start from one end and plan your day. This blog is about my recent visit to Veegaland (Wonder La) Kochi. Read this Veegaland review to find how we liked the place and what we did not like. Kochi Metro Rail Limited (KMRL) has published the ticket rates and fair stages for the Kochi Metro. If you are looking for the current ticket rates in Kochi Metro, check out the details below. If you are looking for information on Country Club Kochi, known as Rock Springs, read this review. This is my first visit to any of their club locations in India and I have provided a comprehensive review of this mid-range resort. Kochi Metro will be inaugurated by the prime minister Mr. Narendra Modi on 17 June, 2017. See some of the pre-inauguration photos of the Kochi Metro.